Did you know that up to 40% of what’s in your waste bin (by weight) is actually organic waste? With a separate collection, it has been proven that householders actually reduce the amount of food waste created, helping to save on waste disposal and SAVE on shopping bills. Food waste collected separately is not subject to landfill tax, so you will save money. Food waste can be composted into a very useful fertiliser for soil conditioning and land reclamation. Food waste can also be processed into a bio-gas – this can be used to generate electricity. See our video below. Using Clean Ireland Recycling’s brown bin service reduces your carbon footprint and saves you money. EU environmental regulation states that Ireland must reduce the amount of organic material sent to disposal. When this organic material is in our landfills, it releases harmful greenhouse gases such as methane and carbon dioxide which contribute to global warming. Also, the liquids (known as leachate) that seep into the ground are extremely harmful to ground water supplies. All waste service providers are now obliged by LAW to provide a separate collection for household food waste in populated areas. Clean Ireland Recycling will provide you with a separate food waste collection service. FACT … it helps you safeguard the environment, is easy to use and saves you money. WHAT DO I RECEIVE FROM CLEAN IRELAND RECYCLING? Both containers are sealed with lockable lids – this system has been used for this purpose in Europe and other countries over many years. Odours, animals, pests, etc. will not present a problem. • Put a newspaper leaf or a compostable paper liner into the 7 ltr kitchen caddy. • Place all your food waste into the 7 ltr kitchen caddy and then, when full, transfer the waste into the 25 litre brown bin. • As always, please remember to put your bin out the night before. DO NOT USE ANY TYPE OF PLASTIC BAGS AS LINERS IN THE CONTAINERS. If necessary, the 7 ltr kitchen caddy can be easily washed in any standard kitchen sink. WHAT CAN I NOT PUT IN MY BROWN BIN? • Glass, metal, plastic, rubber, textiles, nappies, soil, rubble, or any other non-food types of waste. 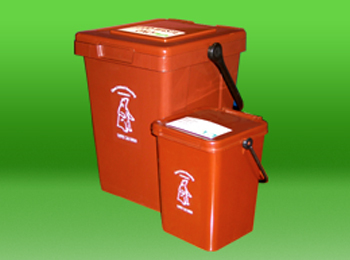 • Your collection details are on the leaflet you received with your brown bin. HOW CAN I DISPOSE OF MY GARDEN WASTE CHEAPLY? Clean Ireland Recycling always endeavours to provide you with the cheapest option for your waste disposal. Create a compost heap at the end of your garden. Over time this material will decompose to release nutrients into the ground and will end up being a very useful fertiliser for flower beds, etc. Once food waste is removed, garden waste does not attract rodents. Mix it with other carbon rich materials in your home composter. Be sure to fully understand the correct procedures for home composting as it is important to get the correct mix of Carbon and Nitrogen rich materials. Read our Compost Manual for further details. Use your local recycling centre*. There are many recycling centres throughout the Mid-West Region that accept grass and other garden waste. *These recycling centres do not accept food waste. If for some reason none of these recommended options suit you, Clean Ireland Recycling can provide a separate garden waste collection in certain areas. Download and read our Compost Manual. Visit www.stopfoodwaste.ie for lots of helpful information on reducing your food waste.